Most grain insects aren’t as choosy – they’ll feast on both animal and human food supplies. But the Granary Weevil can’t fly, unlike other closely related insects. As it evolved, its wings fused together, making it difficult to travel beyond its birth in a pile of grain destined for homo sapiens. Nevertheless, it has managed to infiltrate grains all over the world for thousands of years, even finding its way into Egyptian tombs. How could this be? Basically, Granary Weevils act like a stowaways, hidden as larvae within a kernel of grain while they develop. So they don’t simply “find their way” into your pantry. They’re already in the corn, oat, or wheat product when you buy it and bring it home. 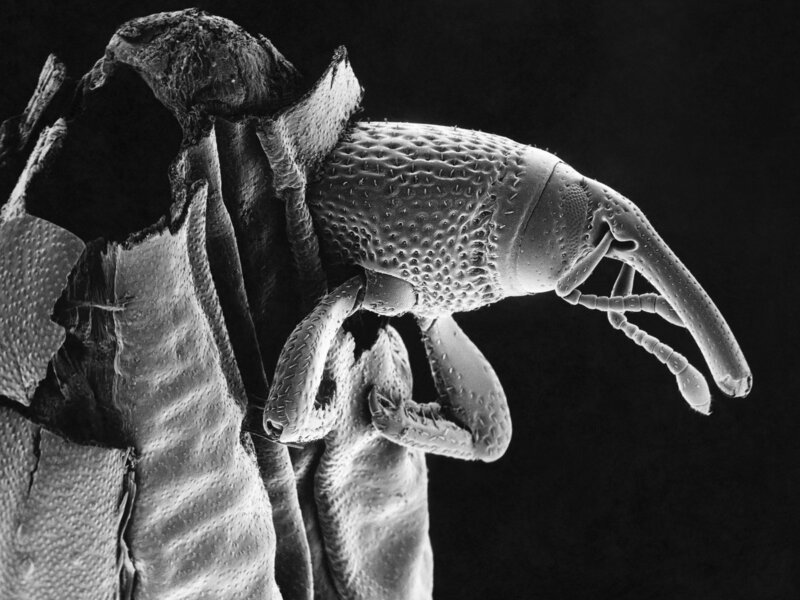 The weevil’s ability to remain undetected until it’s hatched has been cited as proof that it evolved along with human societies during the process of natural selection. Too bad the Granary Weevil is not just a fascinating bit of trivia; it’s also a threat to the food supply. In fact, every year insect pests infest and destroy two to five percent of harvested grains in developed countries, and up to 50 percent in less-developed countries. If these pests carry disease and are coupled with unsanitary conditions, they can cause widespread outbreaks of foodborne illness, with detrimental effects on a business’s reputation, not to mention lost profits by damaging food inventory and opportunities for repeat business. Food processing facilities with huge warehouses are most prone to infestation. They provide the perfect conditions for attracting and nurturing a variety of pests: plentiful food, water, and hiding spots for nesting. Managers of storage facilities must be especially aware of the hazards posed by insect pests. Retail facilities and restaurants are equally at risk, even if on a smaller scale. Convenience stores, supermarkets, and restaurants cannot afford to offend customers with the repellant presence of insects, dead or alive, especially now that social media has the ability to spread negative posts and photos like wildfire. A single pest-related incident can lead to hefty fines from health departments, or in more severe cases, permanent closure. Flies: The common house fly has been found to carry more than 100 kinds of disease-causing germs, including Salmonella and Listeria. Cockroaches: These unsightly pests are also known to spread 33 kinds of bacteria, six kinds of parasitic worms, and seven other kinds of human pathogens, including Salmonella, Vibrio cholerae and Staphylococcus aureus. Beetles: Including the weevil, they can contaminate food by leaving body parts that may accidentally be ground up into food products or by infesting flour, grains, and cereals that are then shipped to grocery stores, restaurants and eventually homes. At the very least, any commercial food processing and service operation must comply with legal statutes governing pest management, safety and food protection, such as the FDA’s Food Safety Modernization Act (FSMA). Local, state, and federal regulations require mandatory compliance to pass health inspections. Pest prevention works best when facility management adds an Integrated Pest Management (IPM) component into their food service management system (FSMS), specific to the needs of the facility. This component should include regular inspections at least once a month, in addition to proactive pest-proofing measures and the development of an action plan that can be used if an infestation occurs. Seal all pest entry points around pipes, the foundation, and loading docks. Install screens in windows to keep flying insects out. Institute a “no-prop” door policy for employees. Consider the use of sodium vapor outdoor lighting to discourage pests that are attracted to light. Perform regular inspections of storage areas, equipment, drop ceilings, processing areas, locker rooms, windows, and laboratories for signs of insect or rodent infestations. A pest management program is essential to protect your bottom line. Corporate executives and food facility managers must ensure that all links in the food safety chain are properly maintained through continuous staff training. Only when all employees understand the significant contamination risks posed by pests, and fully recognize the value of being proactive in pest management, can your business ensure the safety of your food and your customers.